Expansive patios with built-in outdoor kitchens, fire pits, fountains, bars, living room-style furniture and even big TVs seem to dominate articles about backyard decor. 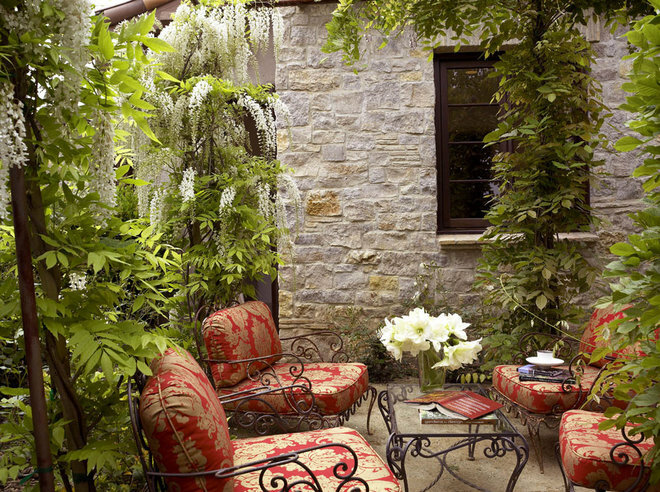 That leaves some of us with smaller patios throwing up our hands with no idea of what to do with our petite spaces. But there’s a charm to these small, sometimes awkwardly shaped patios that those party-size outdoor areas cannot replicate. 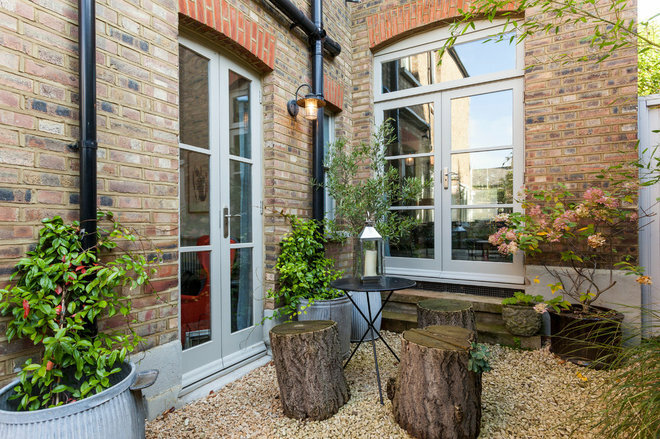 If you’re struggling with how to outfit a smaller patio, here’s some inspiration to help you breathe new life into it and make the most of your outdoor space. 1. Consider built-ins. Obviously, space is at a premium with a small patio. 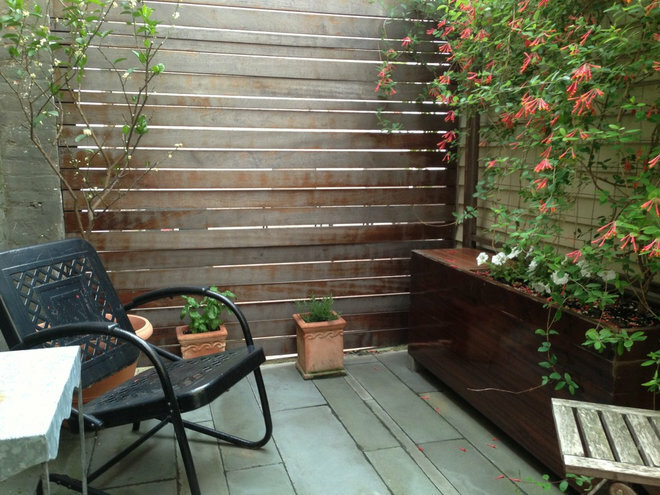 In this modest courtyard, the raised garden bed serves as the back of a built-in bench. This adds room for a generously sized table in the space. Tall trees and slatted trellis walls keep the building walls around the courtyard from feeling oppressive. 2. Integrate local materials. This large stone slab table coordinates with the surface underfoot, making it look as though it emerged from a rock ledge. 3. Go large scale. 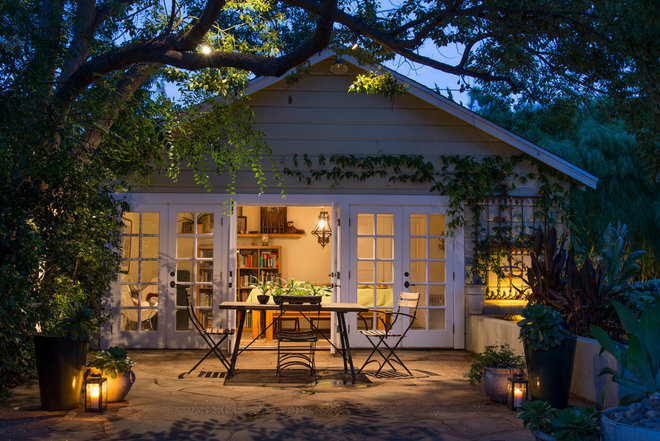 You may think you should put only small things on a small patio, but that’s not the case. 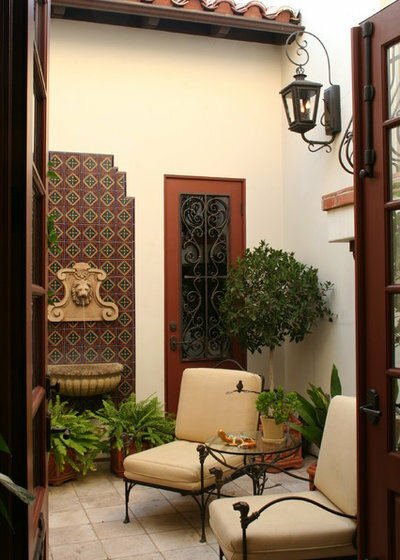 Look how well this oversized urn creates a focal point on this modest-sized patio. Another clever trick here: The raised bed walls serve as extra seating. 4. Think creatively. 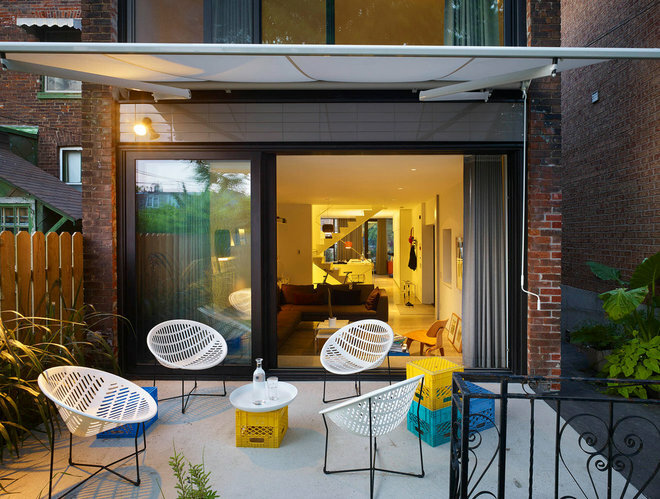 Most of us haven’t used a milk crate as a piece of furniture since college, but in these bright colors and next to this contemporary home they look like something Warhol would have conjured up as an art piece. They are also easy to move around, stack and even use to carry things outside. The bottom line is to let these simple crates — or another budget piece — inspire you to get creative with furnishings beyond typical patio sets. 5. Go tall in a sunken space. 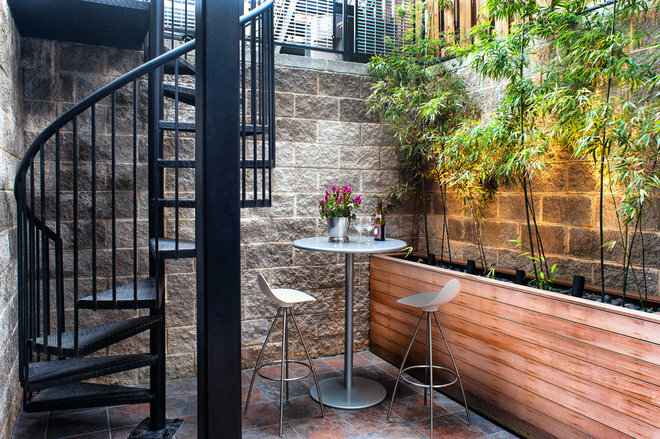 In an urban setting, any outdoor space is a luxury, even one below street level. You just have to make the most of it. A high-top table and tall planting bed complement the scale of this space. 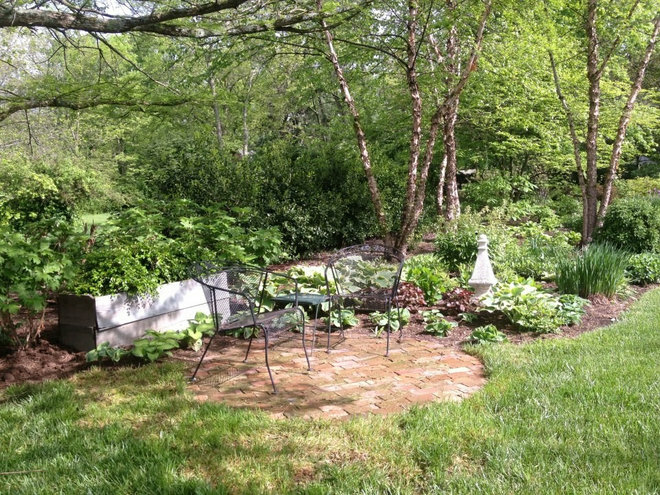 Leaves add softness and create a garden feel. 6. Play off an outbuilding. Patios typically are located off the house, but if you don’t have room to expand there, a detached garage or shed can provide a nice anchor for an outdoor living space. 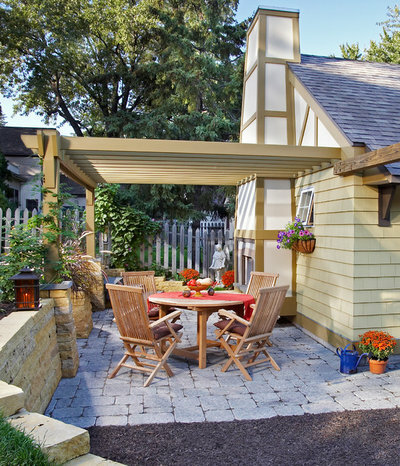 Here, a wood-burning fireplace and window boxes off the garage add warmth and charm to the patio, and the structure also provides a place to anchor a pergola. The designers integrated a dry well and rain garden for runoff from the surfaces and car washing. 7. Embrace a water element. 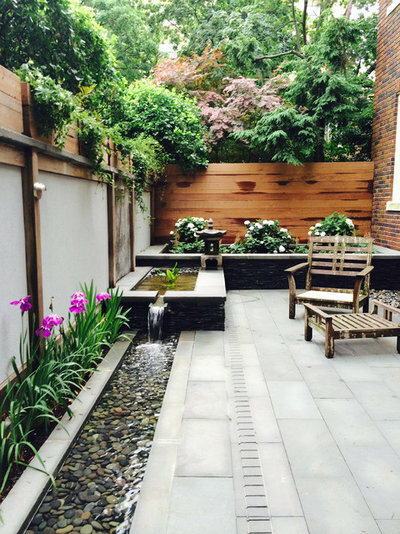 You’d be surprised how well a small patio can take on water features. This urban garden in Washington, D.C., has a wonderfully scaled, stepped-down narrow trough fountain that hugs the perimeter of the patio and helps to mitigate the city noise. 8. Add landscape lighting. Nothing ruins nighttime patio enjoyment like turning on the lone, way-too-bright spotlight you have in your backyard. Softer lighting on the ground and off the house can create a more pleasant mood. If you’re ready to invest in lighting, collect a few hurricanes and lanterns to keep the flames from blowing out in the breeze. 9. Introduce a cafe table. 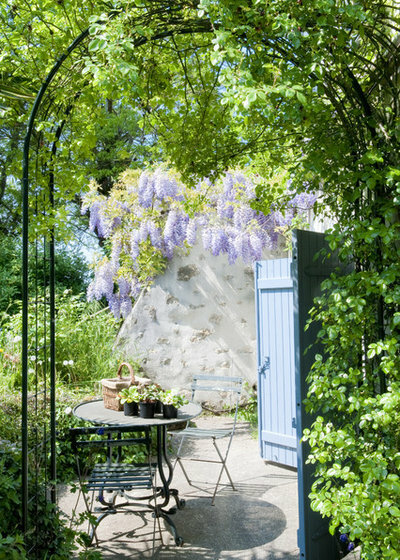 An idyllic French patio with fragrant wisteria and old stone walls — it’s as if the bistro table and chairs were made for this spot. This outdoor furniture set is compact and portable and can fit on the smallest of patios. And of course it brings that French country magic along with it. At this California home, a cafe set can be folded up and stored inside the guest house with ease, then pulled out before guests arrive. 10. Take it to the edge. A small brick patio provides a level surface for iron patio furniture. Now seating is part of the shade garden. 11. 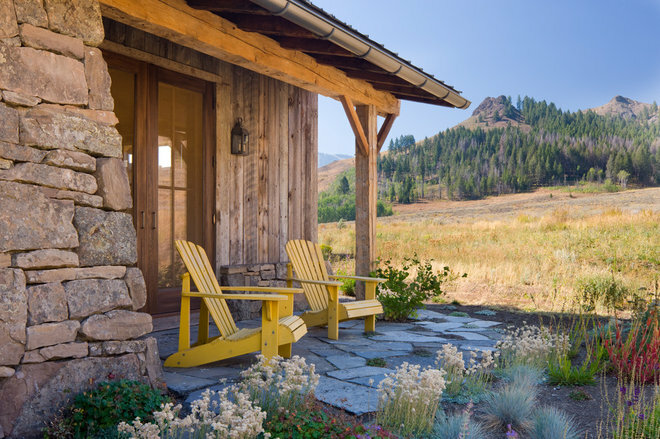 Create eye-catching details.A monolithic wall topped with a picket fence-like border of reclaimed wood changes the feeling on this small patio. Note the way the lighting helps as well. 12. Mix materials with thought. This patio sits in the back corner of the yard. 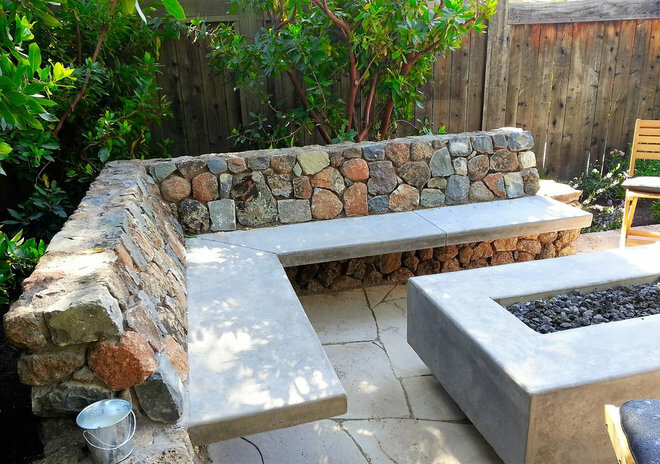 A custom concrete and stone bench, coordinating concrete fire pit and flagstone floor tie it to the yard and the house. 13. Show off a sculpture. 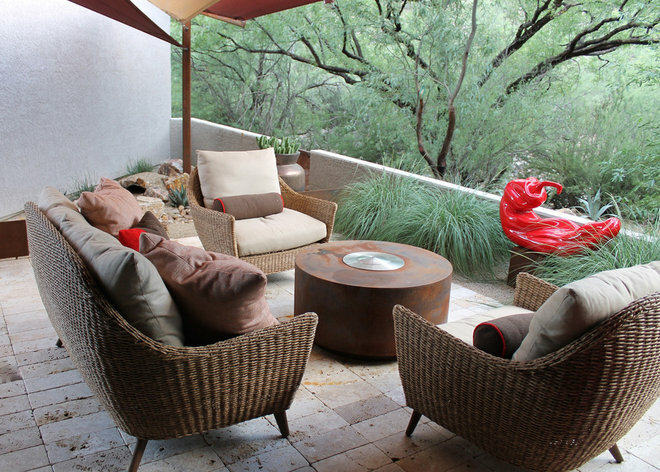 On this Tucson patio, a playful red chili pepper draws the eye out to the landscape, adds bright color and most certainly sparks conversation. 14. Create continuity with paving. In this Spanish Revival home, tiles play a primary role. 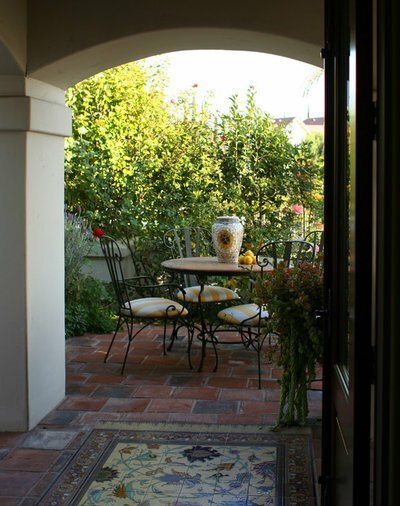 Extending the same tiles under the loggia and out to the small patio lends a feeling of expansiveness. 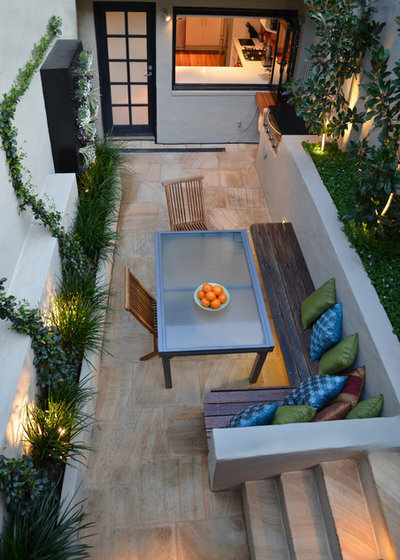 Using the same material from the floor inside to the patio outside creates an easy transition between the two areas. 15. Go vertical with plants. Trellises, narrow planting beds and containers are good ways to bring life and height to a small walled-in patio. 16. Bring in bright color. 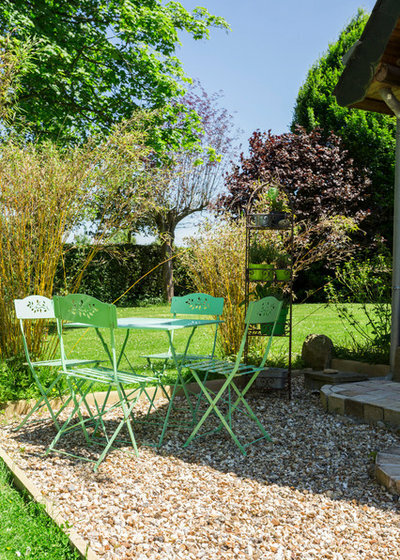 Make the most of the small space and add color to the garden with brightly colored furniture. 17. Carve out a lounging space. 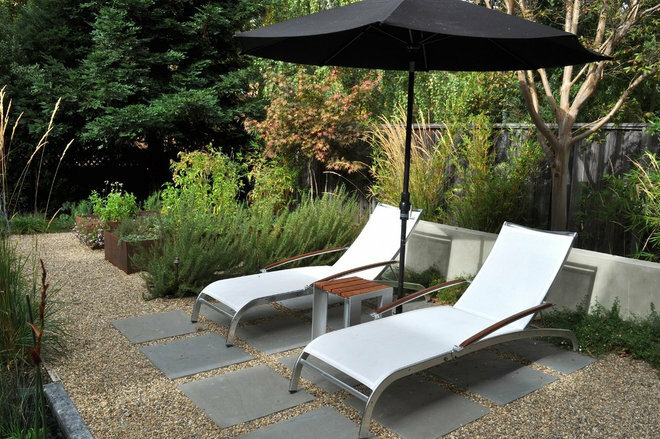 A simple grid of pavers set in gravel provides a flat surface for these two loungers and an umbrella to nestle into the garden. 18. Leave room for two Adirondack chairs. Sometimes all you really need is room enough for you and a loved one to sit together and enjoy the sunset. Here, the pavers extend out just enough off the porch to accommodate two Adirondack chairs. 19. Cozy up with larger pieces. 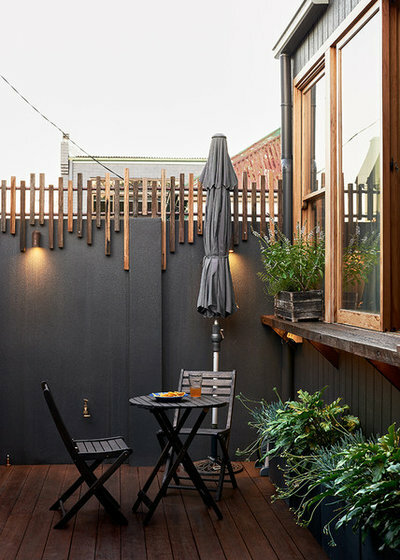 Tiny patios don’t need to be full of tiny things. 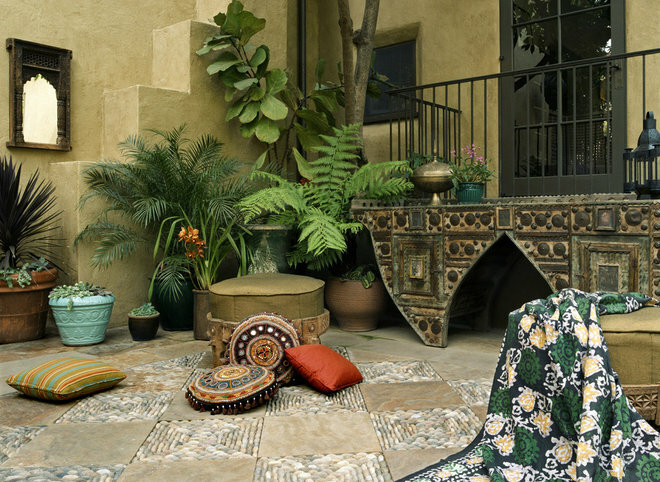 Four comfy chairs nestle into an arrangement that encourages hours of alfresco conversation. 20. Push a table up against the wall. 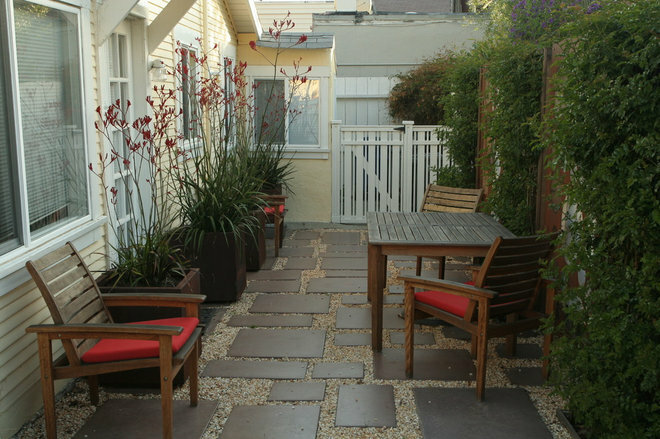 On a narrow patio you may not be able to have a larger table surrounded by chairs and still be able to pass through. But if you consider shoving it to the edge when not in use, you can have the best of both worlds. 21. Go for a casual, natural look. 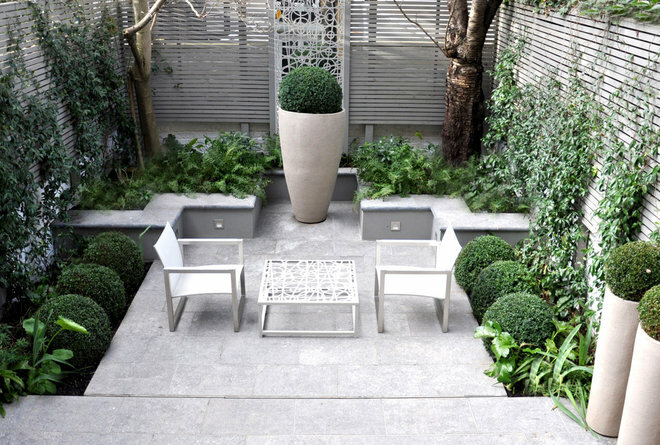 By using log seats, lots of plants and a lovely pea gravel, this small patio blends in well with the landscape and the home. 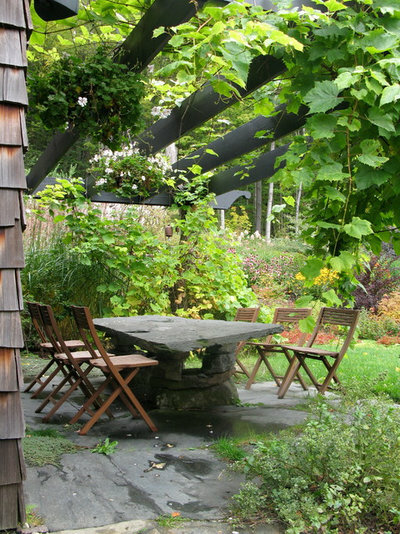 The space is a rustic little secret garden. 22. Make the most of walls. On a patio without much space on the ground, use walls to mount elements like fountains, sculptures, window boxes and lighting. 23. Use scale wisely. For this long, narrow patio, a long, narrow dining table and built-in benches are just the right fit. 24. Integrate with the architecture. 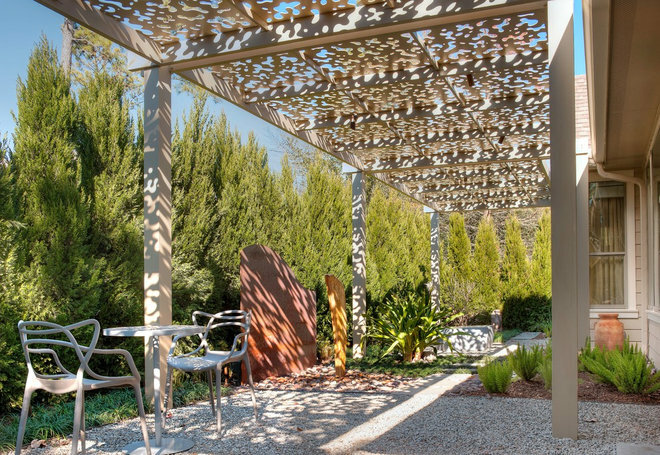 This modern pergola connects the patio to the home while providing wonderful dappled shade. 25. Play up surfaces. A plain concrete slab certainly has its place, but the surface of your patio is a big opportunity to add color and texture. Here, pavers and individually placed stones create a tactile checkerboard effect.